1. We encourage you to arrive early to avoid delays and help speed the entry of all spectators. 2. 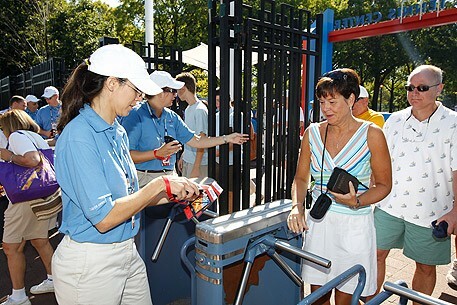 All fans will go through a screening process before passing through the USTA Billie Jean King National Tennis Center entry gates. 4. All bags are subject to search and cannot be larger than 12"W x 12"H x 16"L.
5. There will be no bag storage on the grounds. For a nominal charge, there is a bag storage facility located outside the East Gate and South Gate entrances. 6. Speed lines for those fans without bags will be available at all gates. Your cooperation, patience and understanding are greatly appreciated as we enhance and expand our security efforts to make your visit to the US Open safe and enjoyable.